Who are your young sporting heroes? NOMINATIONS are coming in for the Chichester and District Youth Sport and Community Awards – but it’s not too late to get involved. 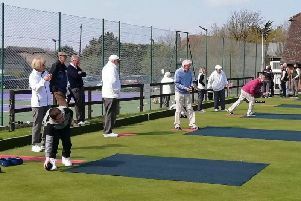 The scheme, run by Chichester District Council and backed by the Observer and the Rotary Club of Chichester Priory, is being run for a 13th year. Celebrating the success and hard work of the area’s young sports stars, the awards have this year had new categories added. The YSA award is broken down into three categories – bronze for a young sportsman or woman who has represented their district, silver for those who have represented their county or region and gold for anyone who has represented their country. Nominations close on Friday, April 24. The awards ceremony will take place at the University of Chichester on Friday, July 10 at 6.30pm. Cllr Eileen Lintill, the council’s cabinet member for wellbeing and community services, said: “Our youth achievement awards are a wonderful opportunity for recognising the dedication and hard work that takes place at grass-roots level. “We have some very talented and committed young sportspeople who deserve a spot in the limelight. Nominations can be made online – go to www.chichester.gov. uk/sport to get involved.